As 2011 comes to a close, I’ve decided to take the time to reflect upon and reveal my choice of Top Ten exhibitions/events that took place this year. 2011 was a great year for art, whether monumental or not. Things are happening and artists are challenging the way that we think and perceive the world we live in. If an artist is able to alter our perception in any shape or form, he/she has succeeded. This year brought forth the 54th Biennale di Venezia and this past autumn, Performa 11 amongst many others. Both the Biennale and Performa exposed the cream of the crop, as well as a few expected failures. However, where one artist or curator fails, another triumphs. 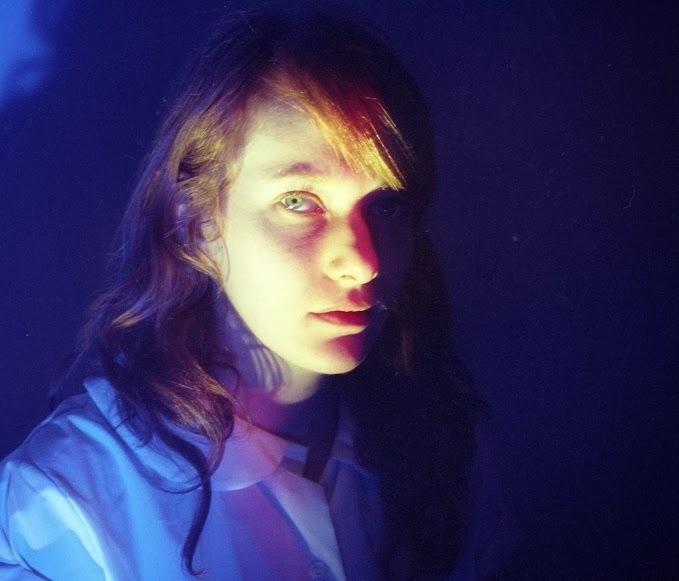 Below, I present the eyes-towards-the-dove Top Ten for Twenty Eleven. Artist Ragnar Kjartansson, represented by Luhring Augustine, took New York by storm with his 12-hour long performance titled Bliss. 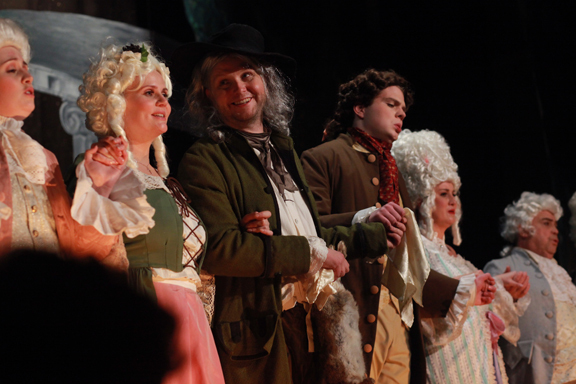 Presented as part of Performa 11, a select group of Icelandic opera singers in full period costume, proceeded to re-enact a scene written by Mozart: The Marriage of Figaro, 1786. The performance was magical, focusing on the repetition of sound and the subtlety of varied movements. All present at the Abrons Art Center were able to observe, as well as experience the physical and psychological exultation in a harmonious expulsion which seemed to last forever but eventually came to an end. Ragnar Kjartansson was the winner of the prestigious Malcolm McLaren Award for Bliss, best overall performance during Performa 11. 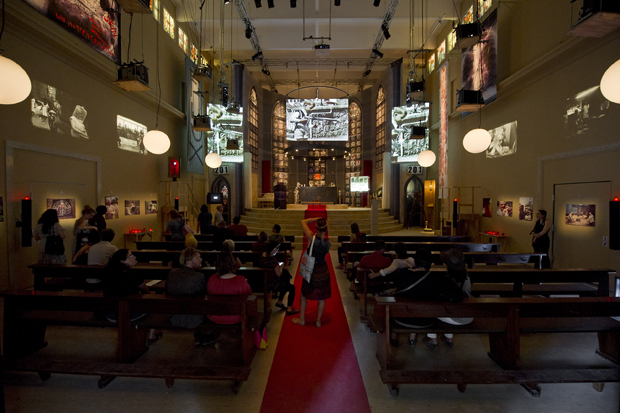 Fluxus Oratorio in the German Pavilion, altar view with film projection. Artist Christoph Schlingensief was selected to represent Germany at the 54th Biennale di Venezia. 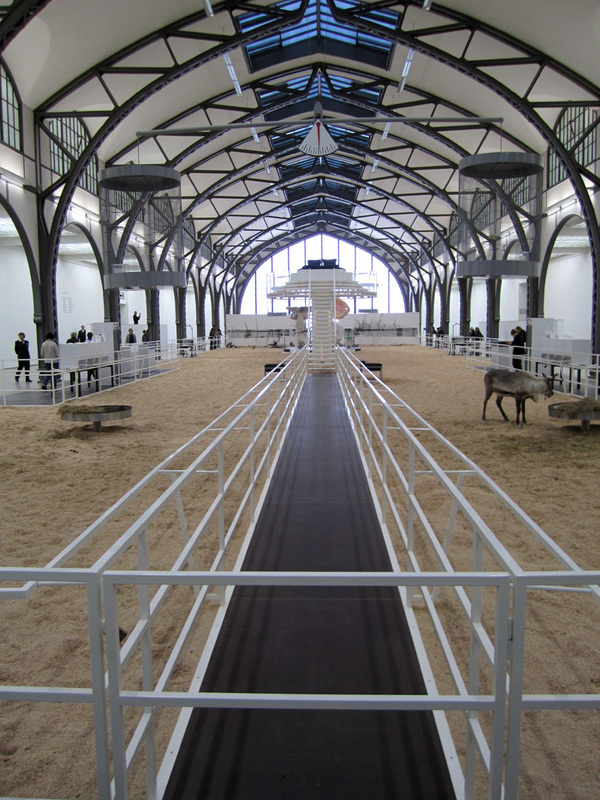 His installation was also chosen by the jury of the Biennale, winning the Golden Lion for best national pavilion, 2011. Sadly, the artist passed away before this project was brought to fruition with his own hands and the award granted, after a long battle with cancer. A Church of Fear vs. The Alien Within is an installation that deals with mortality and is part of a larger project titled Fluxus Oratorio. The entire interior of the German pavilion was transformed into a cathedral and while it may sound a bit contrived, in person, it was actually quite effective. The artist was so raw in his search of self, and the result deftly evident within the various elements with which the installation had been composed. Inside the weighted context of the church is a humanistic hunt for truth not only in what lies beyond, but what exists in the flesh, the blood, the soul. Schlingensief was a multi-dimensional artist and some of his other projects were screening in a Kino in the lower level of the pavilion and his architectural and sociological research regarding his desire to build an opera house in the small African country Burkina Faso, in another gallery within the venue. The exhibit was a vulnerable portrait of the artist who knew he was going to die. It was a dream fulfilled, even if too late for his own eyes to see. Gustav Metzger, born 1926 Nuremberg, Germany is an artist and political activist who helped develop the concept of Auto-Destructive Art in the 1960’s. He immigrated to Britain in 1939 as a refugee and has been stateless since the 1940’s. His life and political awareness has been a driving influence in the prolific art that he makes. Currently based in East London, his work is often directly related to world and environmental events, mostly the consequence of human action. Historic Photographs is an ongoing series composed of large-scale photographs installed in very specific ways. For the exhibition at the New Museum all the photographs were obscured in one way or another. Each image contains specific, sometimes disturbing content from historical world events, ranging from the horrors of the Warsaw ghetto to the bombings in Oklahoma City. While he no longer travels, the artist provides specific instructions regarding the installation of the photographs whereas they are concealed yet can be viewed by way of physical intervention from the viewer. It is in this physical experience where the magic of the exhibition becomes evident. Metzger reveals by concealing and in doing so gives the viewer the chance to feel more than an emotional reaction based on content alone. In the process of obscuring, he taps into the human desire to look behind the curtain, crawl on the floor, or bend and squint between bamboo poles. The photograph may be familiar or completely foreign, either way its content doesn’t come easily and in this case, wasn’t meant to. 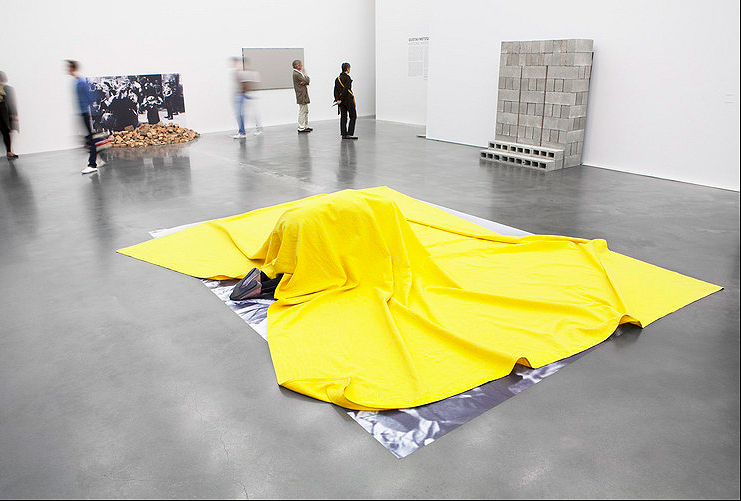 Unlike many exhibitions that occurred in 2011, The Decelerator took place simultaneously in three different cities. 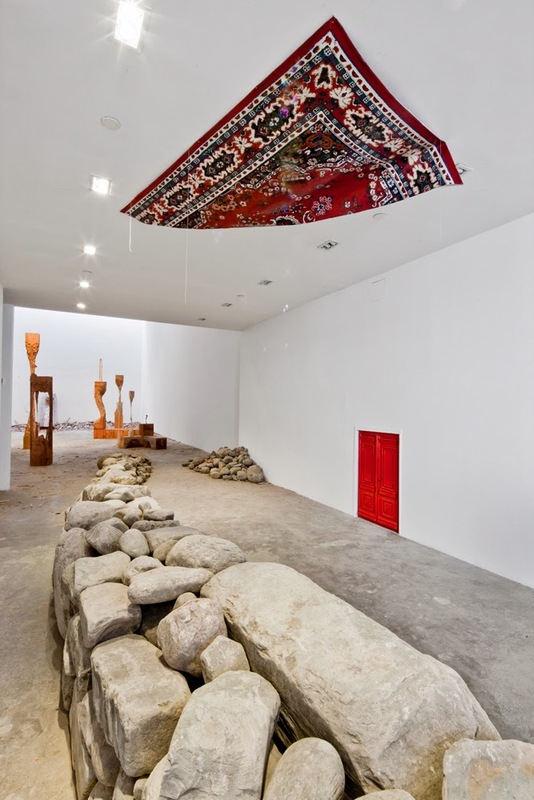 The exhibit, brainchild of curator Leo Kuelbs, was co-curated by Adam Nankervis, along with Kozma Zsolt, with assistance from Amelie Zadeh and featured a roster of both emerging and established international artists. The Decelerator was a museum quality exhibition, that in the age of globalization and the Internet communicated with three different communities, three different countries in a sequential format, not unlike streaming content. Barriers and borders were crossed and in each gallery the interior arrangement allowed for viewers to physically experience the works. Part of this team were also responsible for Immersive Surfaces which was on view as part of the Dumbo Arts Festival. Each exhibit had a way of dealing with time, specific location and occupation of space as well as relationship to public presence. 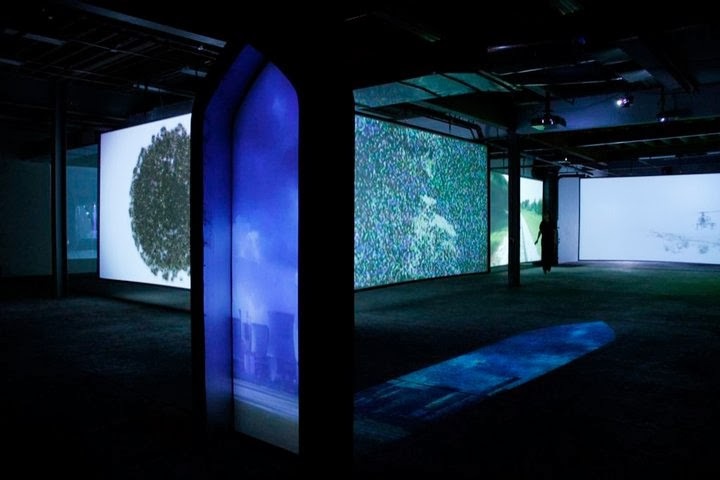 Mapping and site-specific video is on the rise and with the proper curating and organization, takes art out of the frame, off the wall, and projects at a scale that is all encompassing.The exhibit was held at Allan Nederpelt, Brooklyn, NY, Sur la Montagne, Berlin, and Videospace, Budapest, March 18th-April 3rd 2011. Gian Maria Tosatti is an environmental artist from Rome, Italy and recently part of the Lower Manhattan Cultural Council residency on Governors Island. His work consists of imaginary drawings that are architectural plans/documentation of his installations, Polaroids, found postcards, site-specific installation and environmental sculpture. He was able to obtain special permission from the National Park Service in order to make I’ve Been Here Already, Apt #102. 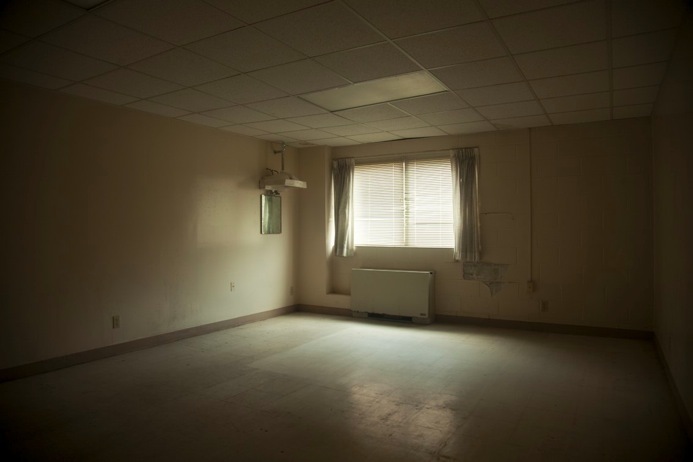 The installation is an imposed memory inside a building, long ago abandoned. The artist interviewed those who have immigrated and migrated to New York seeking dreams and fame. Most never find what they were originally looking for. Some stay and make due with what they have while others depart, leaving traces of presence behind in dust. Gian Maria transforms deserted space into something that is wraught with nostalgia. The installation is temporary and precise, absurd and melancholic. For those who missed the initial viewing, I’ve Been Here Already, Apt #102 will be open to the public summer 2012 on Governors Island. Singer Karen O from the Yeah, Yeah, Yeahs is a Renaissance woman. Over the years, she has worked with several various collaborators in the development of projects outside of the important rock group. For eight days in October, Karen O was part of a theatrical music performance titled Stop The Virgens, at St. Ann’s Warehouse in Dumbo, Brooklyn. The performance was inspiring and energetic. It consisted of a central figure, Karen O, as a queen with a minion of Virgens. The Virgens, complete with bleached, cropped hair and skin, gawked and sang back up in choral format. Upon entering the space, they whispered and clawed through gauzy fabric. At times during the performance they unexpectedly walked into the standing-room-only floor space, singing and gawking somewhat menacingly at those present. In a glorious mix of costume changes, dance routines and an obscure storyline, the result is that the queen, Karen O, gleefully poisons all of the Virgens in a bloodbath of collapse. It was a feat that for any fan of the Yeah, Yeah, Yeahs, was not to be missed. Michelangelo Frammartino’sLe Quattro Volte, filmed 2010, had its New York screen debut at Film Forum, spring 2011. The film, which is mostly silent, is an existential romp through a small, remote village and countryside of Calabria, a region in Southern, Italy. Exquisitely shot, Le Quattro Volte transports the viewer into the grassy fields with an elderly herder, a pile of charred wood, and presents an intimate view of a goat giving birth. Their is a thread of melancholy throughout the entire film, however in that delicate notion, one is also reminded of hope and the undeniable strength that we all have to survive.